Oh forget it. I can't keep it up. I'm sure I'd be pretty useless if I ever chose to participate in the International Talk Like a Pirate Day. If you've never heard of it, it's held on the 19th September every year and it's an official holiday for the Church of the Flying Spaghetti Monster. And that's the best of them (coughs). Just imagine what they edited out. And to think there wasn't a single poop deck joke in the whole guide. Regardless of all of this, avast is a jolly (roger) interesting word, and I had no idea of either its etymology nor its meaning until I read it in the dictionary (I always thought it meant something like 'Ahoy!' or 'You there!'). At least, come the 19th of September, I will know exactly what to say should anyone fire an 'Ahoy matey!' across my starboard bow: "Avast, please ... just ... avast." If you'd like to see me swing from the yardarm for just not getting down with this whole talk like a pirate thing, do scrimshaw me a message in the comments section. 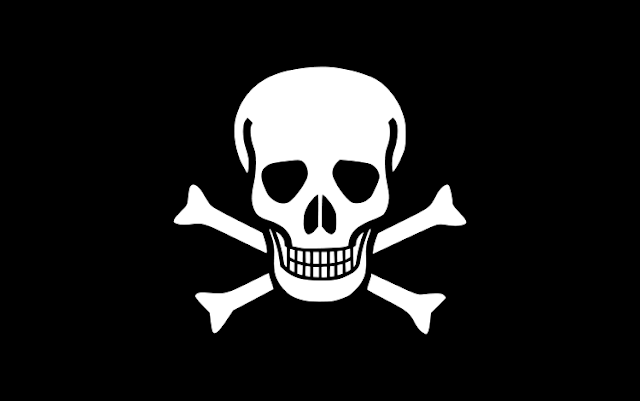 Know ye this, though, ye old blog-lubber: if ye want any moral authority on this here matter, your comment'd better be in pirate talk! Aaaaaaargh! Uhm *raises hand*... can I be excused from pirate-talk? I'm not even a native English speaker, let alone an English pirate one. Ooooh, it's Dutch *makes happy dance* Doesn't come as a surprise, actually, with the United East India Company and all. RYC: You should grow your hair longer. When it's long (past your shoulders) it doesn't itch as much, because it can't fall into your shirt. Though as a man, you would look a bit like a hippie. But maybe that's your thing, I don't know. OK Bibi ... you were granted an ... oh! I mean ... umm ... Aaargh, Bibi, ye wee barnacle! Stay o' execution be granted to ye, not bein' a native speaker an all! Aaargh.